Mind Benders are carefully developed deductive logic puzzles. To solve them children need to carefully analyze each word and the precise meaning of the clues provided. This enhances reading comprehension and develops the type of reading for detail needed for testing. Deductive logic is the skill used when one doesn't know the answer but uses the information provided to eliminate the obviously wrong and improve ones chances of guessing accurately. Deductive logic is an important skill for life. Mind Benders are fun puzzles. Your child may not even realize they're working. 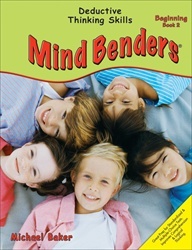 Mind Benders Beginning Book 2 was reprinted in 2010 as Mind Benders Book 2. Apart from the name change the books are identical.